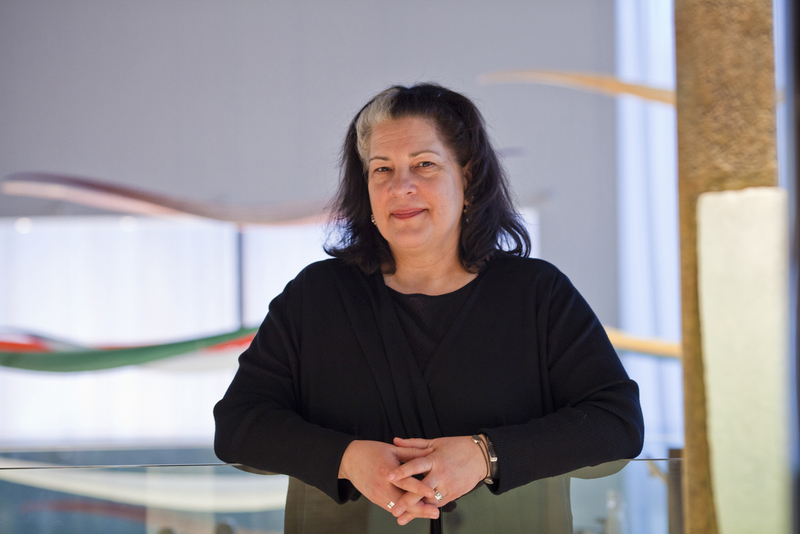 Tina Oldknow has been a vital part of The Corning Museum of Glass since 2000, when she became the curator of modern glass, responsible for all curatorial aspects of the glass collections dating from 1900 to the present. 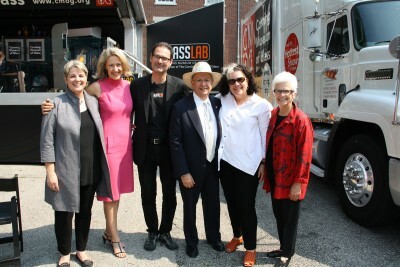 During that time, she managed countless acquisitions to the collection, curated successful shows including Voices of Contemporary Glass: The Heineman Collection and Making Ideas: Experiments in Design at GlassLab, curated the inaugural exhibition in the Contemporary Art + Design Wing, and became an integral part of the glass community. Just prior to Tina Oldknow’s retirement in September, we asked her a few questions about her tenure here. What would you say was the highlight of your career here at the Museum? The opening of the Contemporary Art + Design Wing, of course!! What was your favorite program to be involved with? GlassLab, the Museum’s signature design program. I think is one of the Museum’s most potentially influential programs. Tina Oldknow during a GlassLab session on Governor’s Island, NY. Tina helps install Kiki Smith’s ‘Constellation’ in the new Contemporary Art + Design Wing. What is your fondest memory from interactions with artists? 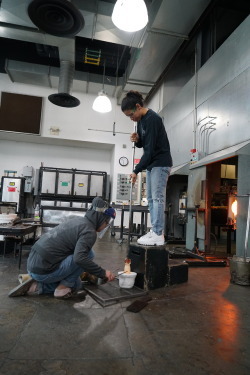 One fond memory I have is of Andrew Erdos shooting a video at Alfred University with hot glass and fire. It was pretty extreme. The fire alarms went off, the police came, and Andrew handled them beautifully. Meanwhile, the crowd dispersed, not wanting to be anywhere near where police were. 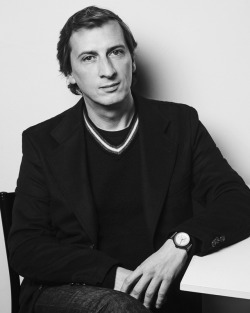 Most importantly, I get inspired by talking with artists, who are the real thinkers and philosophers in our society. How many pieces would you say you’ve acquired in the time you’ve been here? I have acquired hundreds of objects through gifts and purchase in the 15 years I have been here. What is the strangest way you’ve discovered a piece you then knew you wanted to add to the Museum’s collection? 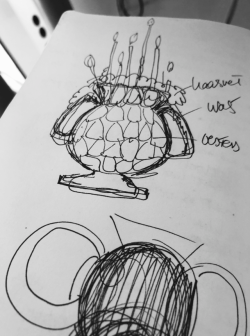 The Museum’s important Dreyfus vase, Les Hommes Noirs (The dark men), by Emile Gallé and Victor Prouvé, came to my attention from the Museum’s general curatorial email address. Generally, we know most of the glass dealers around the world, but we did not know this one. For you, what made a piece of glass worth adding to the Museum’s collection? 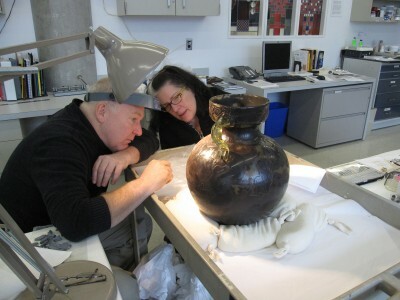 There are so many different reasons for adding objects to the Museum’s collections. The reasons for adding a large contemporary sculpture will naturally be much different than the reasons for adding an Art Nouveau vase or a mid-century design for kitchenware. Two things that are always important are innovation and high quality, and the more aspects of a work that hit those marks—technically, conceptually, historically—the better. Tina Oldknow and Karol Wight. What will you miss most about the Museum? The people, including the staff at the Museum with whom I have worked most closely, but also the network of amazing artists, super-smart curators, and a few really important (to me) collectors who I have come to know over the years. How will you remain involved with the glass community? I hope to continue writing about glass. There is so much to say. Tina retired from the Museum on September 30. I had planned to contact Ms. Oldknow directly. She wrote the Foreword for “Kait Rhoades,” describing her glassmaking art in the Heart Vessel and Peacock series. I own a very beautiful example of her art from the Heart Vessel series, which I am now obliged to sell. I was hoping she could make suggestions, or put me in contact with a prospective buyer. I have tried ebay and craigslist to no avail. IPerhaps this message could be forwarded to her, and I could enclose a picture of this objet d’art.